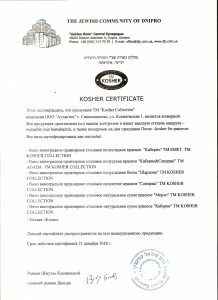 TM Kosher Collection wines are the only kosher wines in Ukraine, which are produced under the control of the chief rabbi of Dnipropetrovsk Jewish community. The range of products in the collection can cater for the needs of the most demanding consumers. The best wines are at their disposal. TM Kosher Collection wines are made according to the most ancient technologies of strict rules of kashrut. That is why there is a careful selection of each berry, and grapes are collected only from one field for each product in the line. All stages of production, starting with the squeezing of juice, are made by religious Jews, using modern high-tech equipment. TM Kosher Collection wines would worthily accompany your family dinner, a Saturday meal and traditional religious holidays. Kashrut certificate and a marking on the label confirm that it is a kosher product, thereby ensuring its quality, purity and health benefits.